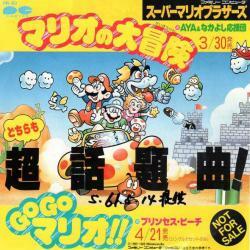 Mario no Daibouken/GO GO Mario!! Mario's Big Adventure/GO GO Mario!! This is a promotional sample album, which was never officially sold. All music arranged from Super Mario Bros. original score by Koji Kondo. Track 1 contains vocals set to an arranged version of the overworld theme and the ending music from the Super Mario Brothers game. Track 2 is an arrangement of the Super Mario Brothers overworld theme with vocals by Princess Peach. "Princess Peach" is actually Hiroko Taniyama, but she isn't credited on the album as such. Super Mario Bros. / スーパーマリオブラザーズ / Super Mario Bros.